Other Products by Maxines Burn. Search other Fat Metabolisers products. 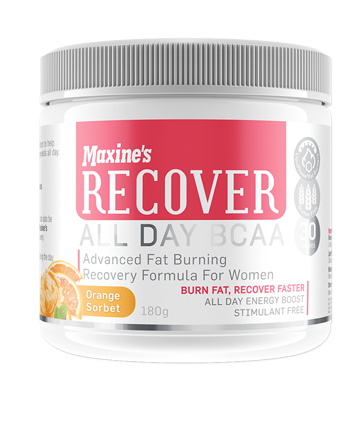 Maxines Recover provides an advanced fat burning, muscle recovery accelerator to have you looking toned and ready for your next workout. 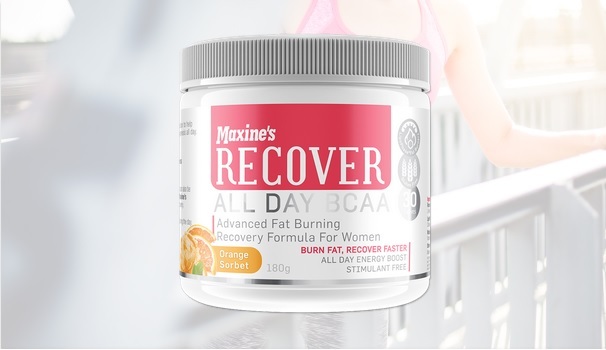 Maxines Recover delivers the BCAA's necessary for protein synthesis and the anticatabolic glutamine to preserve your hard earned muscle. Together with the LipoPhase thermogenic ingredients, Maxines Recover helps you build and maintain a lean, toned physique. Take 1 heaped scoop (6g) in 200-300ml of cold water immediately after your strength or cardio workout. To further improve recovery and fat burning take 1 serve mid-morning and on serve before bed. INGREDIENTS: L-Leucine 1700mg, Creatine Monohydrate 1240mg, L-Isoleucine 570mg, L-Valine 570mg, L-Glutamine 570mg, LipoPhase® (Acetyl-L-Carnitine 230mg, Garcinia Cambogia 115mg, Choline 55mg, Inositol 55mg, Phaseolamin 55mg, Green Tea Extract 55mg), L-Taurine 290mg, Vitmain C 115mg, Magnesium Oxide 55mg, Vitamin E 15mg. Other ingredients: Citric Acid, Sweetener (Sucralose), Natural Colours (Beta Carotene, Carmine).